Local entrepreneurs had an opportunity to showcase their skills at a special event to celebrate the creative industries hosted by the University of Ulster at the Magee campus this week. Ceramics, decorative glass, sculptures, jewellery, papers crafts and landscape prints - all handcrafted - were on display. The event marked the completion of the Magee based Creativity Thirst programme, a programme developed by the Workers’ Educational Association (WEA) and delivered in association with the University of Ulster. The Creativity Thirst programme was designed specifically to encourage people to look at employment opportunities in the creative industries, it is for people thinking of setting up their own business or hoping to gain extra income in the creative industries, explains Deborah Fraser, Associate Head of School of Art and Design. “The idea is to provide information to those wishing to get involved in business start up and to assist them to explore the implications of self-employment and starting/running their own business. “With the help of specialist mentors relevant to their business idea, participants were able to identify potential employment opportunities, shown how to develop a business plan and to produce their own promotional material. Creatively Thirst was funded by the Creative Industries Innovation Fund which is supported by the Arts Council of Northern Ireland and the Department of Culture Arts and Leisure, (DCAL). 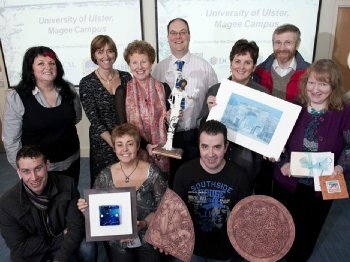 Caption: Local entrepreneurs who completed the University of Ulster’s Creativity Thirst programme with had an opportunity to showcase their handicrafts at a special event to celebrate the creative industries hosted by the University of Ulster and WEA at the Magee campus. Included in the photograph front row, from left to right Diarmuid Maloney, Dublin, who is studying Creative Technologies at Magee; Ruth Walker, Ballyclare; Ray Logue, Derry. Back Row, Lorraine McWilliams, Derry; Deborah Fraser, Associate Head, School of Art and Design, University of Ulster; Gloria Perry, Strabane; Diarmuid Moore, WEA; Frances Sweeney, Omagh; Sean Taggart, Omagh; Valerie Semple, Limavady.